I don't remember how old I was when I first started hearing rumors about, "Paul, Kevin's friend from the Wonder Years," but once I heard the first, all of the rest quickly followed. 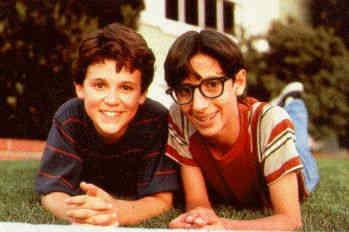 When the show was still on the air, I heard that he and Winnie Cooper were a couple off screen, and it was actually Kevin (played by Fred Savage) who was really a nerd. Years after the show went into syndication, someone told me, with such conviction I couldn't help but at least consider it, that Paul had grown up to become Marilyn Manson. I'm not sure who comes up with these rumors, or why Paul from the Wonder Years was always the main character in them (what did he ever do to anyone? ), but by far the most tragic of all was that he was dead, and the seemingly innocent activity that killed him? Eating Pop Rocks and drinking Coca-Cola at the same time. She was kidding, of course, and all research (i.e. 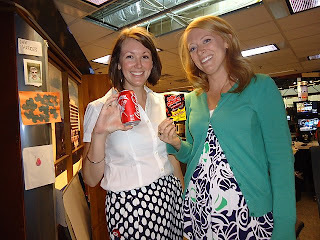 Internet searches) led me to believe that no one had ever died by drinking Coca Cola and eating Pop Rocks. If Paul from the Wonder Years had ever even tried it (and there was absolutely no evidence that he did), his questionable choice didn't kill him. He was alive and well. But rumors usually have some basis in fact, don't they? What if someone did die trying this? Was I playing with fire? There were just seven days to go until my birthday; should I risk it? Of course I should! If I'm going down, I'm going down in a blaze of candy and soda! Day 358's thing I've never done before was to mix Pop Rocks and Coca-Cola and hopefully live to tell the tale. Before work, I drove to Richards Variety Store to buy the Pop Rocks, something that I'd looked for at the grocery store and other discount stores, but couldn't find. Richards is a completely random store full of anything from hilarious greeting cards to hand crank egg beaters to Pez dispensers. I could spend many hours and several hundred dollars there. Emily happily joined me for this challenge when I told her what I was up to, and I asked Justin to film it. The video is long, and includes Emily and I willing our personal possessions to members of our families in case the urban legend was true, and this candy soda experiment did make us explode. I willed everything to my brother, Jeff, and sister-in-law, Katie. Everything except for my car, which I said Justin could have, in light of Day 353. Emily willed her stuff to her parents, since, "they are responsible for me having most of it anyway," and because her Mom, Joan, is an active Project 29 to 30 blog reader. I felt badly for having left out my parents completely, so I went on to explain why I left it all to Jeff and Katie. I was actually thinking about my dad complaining, when he can't find anything in his closet or in the attic, "There's too much crap in this house! When I die, it's going to take you kids years to sort through all of it!" (As I've said before, my father talks about his death as if it is happening any minute.) But, understanding his detest of all the clutter that he blames all on my mother, I figured forcing my brother and Katie to acquire all of my things would at least make my dad happy. So after we willed our personal belongings away, Emily and I opened up our Pop Rocks' packages, tilted our heads back, and dumped the contents into our mouth. 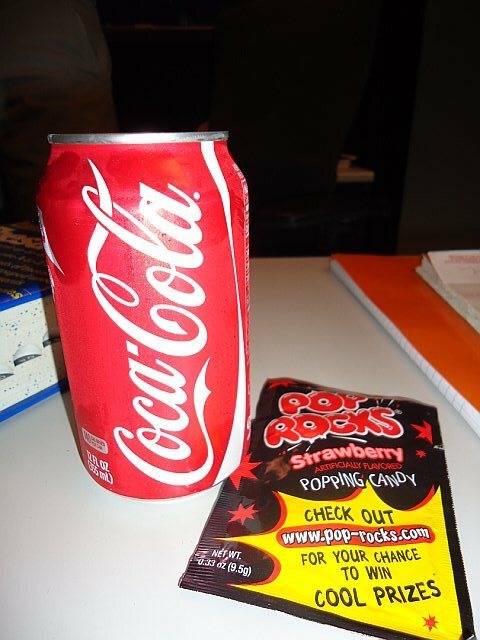 Pop Rocks is a carbonated candy, and the gimmick is that the "rocks" will fizz once eaten. I know that I ate Pop Rocks when I was a little kid, but I didn't remember them tasting so terrible. They're extremely sugary and I felt like my teeth could rot right then and there. I took a sip of coke, which was difficult because there was so much going on with the Pop Rocks. Even after I swallowed, the fizzing continued down my esophagus. It was all very weird. I could have expected some negative life-threatening reaction and there wasn't one. I survived! Emily said she thinks the bubbles of the soda negate the bubbles of the Pop Rocks, but I couldn't disagree more. I couldn't even taste anything, all I could taste were bubbles and sugar. But we lived. Like it or not, I thought, I would make it to 30. I had to laugh at this ridiculous rumor and how it got started in the first place. I imagine someone retells a story so many times that words and tenses get omitted or mixed up. After having tried this combo myself, I have to believe that if Paul from the Wonder Years tried it, be probably said afterward that he wanted to die. Which makes perfect sense, because it's weird. And disgusting.